Skin of dead puppies, oils made of swallows and juice of snails may not be what the doctor ordered for modern day illnesses. But a Swansea University historian has discovered they were just some of the weird and unbelievable remedies that were commonly used for ailments in Wales in the 17th and 18th Centuries. Dr Alun Withey has ploughed through old records to shed light on the little known world of Welsh traditional medicine between 1600 and 1750. He said what he found gives an insight into the beliefs and lifestyles of people living in Wales centuries ago and overturns assumptions that many had about old Welsh communities being insular and remote. "Whilst the medicine they used sounds weird to us, they were perfectly normal for the time and were what they thought worked," he said. "Anything from dead animals was believed to be incredibly powerful - because it had been alive they thought it had healing powers. "For example, snail juice would be used for the eyes and would be dropped in. The logic was that the eye was wet like the snail juice. Skin of dead puppies - Used in an ointment for the skin. Oils of swallows - used for "shrunken sinews" (withered limbs). 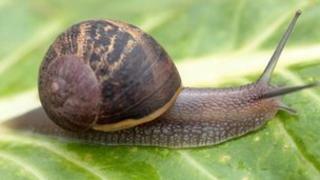 Juice of snails - were dropped into eyes for eye conditions. Earth worms - held to boils to heal them. Calves lung water (a remedy made from calves lung, garden snails, milk, eggs and nutmeg) - drunk for consumption (which later became tuberculosis). Halved cockerel, including guts and feathers - held over an adder bite for seven to eight hours, followed by giving a patient treacle to keep the poison from the heart. "They couldn't see inside the body so they looked around them to see what was happening." Dr Withey said the average life expectancy in Wales at the time was around 36 years old, although if people made it to that age they could go on to live another 30 years or so because they would have developed good immunity during the "dangerous" childhood years. But Welsh people were considerably poor compared to other parts of the UK, with bad diets and living conditions, which increased their chances of getting ill. He said in a lot of the English literature he studied as part of his research, there was a recurring stereotype of the poor Welsh man - called Poor Taff. "He was the beggarly, slightly odd country cousin figure who talks all the time about goats and cheese and talks in an odd Welsh language," he said, adding that the character even appeared in Shakespeare's Henry V as Fluellen. But his research suggested this typical view that the Welsh were remote and insular was wrong, shown by the medicine they used. "For example, there was a little village shop I found near Cowbridge which sold herbs and spices from the Indies. It shows Wales wasn't insular and had contact with outside," he said. "People were using remedies that people in London were also using. They were more aware of things than we give them credit for. "While we must remember most people spoke only Welsh and couldn't really read back then, they learnt and they shared remedies by word of mouth. "Each household had its favourite remedies - like now - which were passed down the generations and it was very common for neighbours to share information." He said rather than the big disease epidemics of the time, some of the worst illnesses faced in Wales were those which have become easily treatable today. "A lot of people suffered from the common cold, which could kill you back then, and stomach upsets - things that now we could treat with antibiotics," said Dr Withey, who has compiled his research in a new book called Physick and the Family. "A headache was considered very serious back then." He said the plague did not have a big impact in Wales, like it did in other parts of the UK, which he believes is because it decreased with altitude. "Mountain air was considered healthy, while marshy areas were considered unhealthy back then," he said. "Only a few places in Wales were affected by the plague, including Tenby and Haverfordwest, which were port towns." Dr Withey said that back in the 17th and 18th Centuries there were no hospitals - the first to open in Wales was the Swansea Infirmary in the 19th Century. But every community would have had a medical practitioner of some sort, even if it was the blacksmith who would take teeth out. People would travel around communities claiming to treat the sick - called Dyn Hysbys, or Wise Men - who would give people charms to chant to get rid of illness. Dr Withey said it played on the belief that religion and health were linked. "Religion was very closely linked to sickness at that time, although it became less so as time went on" he said. "There were all sorts of charms that you were supposed to remember and recite to help illness go. "There's even one based on the Lord's Prayer for tooth ache." He said there was a stigma attached to illness and disability, with a belief that deformities were caused by the sins of the parent. "Smallpox was one of the most feared diseases in Wales," he added. "If it didn't kill you it scarred you for life. It went through families and particularly took children, so it was hated. "But the worst thing was the scars afterwards. Even though they meant you were now immune to smallpox, having visible scars meant you were looked down upon." Dr Withey said that even though many of the traditional Welsh remedies have now disappeared, many ingredients that were used have gone on to inform modern medicine. "Honey was used on burns and obviously now it is used for good health, like for sore throats," he said. "And they used a lots of herbs and plants. Of course, the basis for all pharmacy drugs now is plants. People often forget that."